The list is ever-changing, but below are my kids' and my current top 5 favorite picture books to read at bedtime. When I saw this book in stores, I was immediately drawn to the quirky sensibility of Jeffers' illustrations and storytelling. The whole thing looked and sounded unlike any other picture book I'd seen. Sure, I liked it, but I didn't think my kids would be engaged by the dry humor and funky illustrations. Boy, was I wrong. We love reading this book together. MacDonald's retro style illustrations are gorgeous in this very funny picture book and my kids always stop me from turning the pages so they can point out their favorite little details. This story of boy Jack coping with a new baby sister is extra fun to read aloud with all of its vivid onomatopoeic words and speech bubbles. This was one of my first picture books as a toddler in the 70's. It's a strange little story about a monkey chef preparing meals in his restaurant. The artwork is photographs of staged toy sets with custom-made sock puppets as the characters, and the whole thing has that early 1970's look and feel. 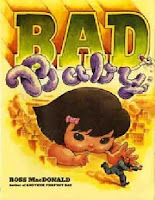 The only credits listed are pictures by Keiko Osonoe with a rhyming story provided by Renwal Products Inc. and copyrighted by the Froebel-kan Company. I include this one in the list because it just shows how even the most modest books can have an impact on someone's life. I've kept this book for nearly 40 years and my kids are fascinated by it. I'd love to meet the actual person who wrote the words. 2. 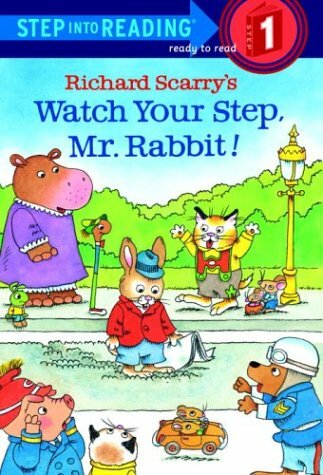 WATCH YOUR STEP, MR. RABBIT! My son Nate is at that exciting point in his life where he's starting to read books by himself. When I realized he was sounding out new words on his own, I ran to the local bookstore and grabbed up some level one readers. This charming little book about a distracted rabbit who gets his feet stuck in cement immediately caught Nate's attention. He proudly tells people he passes on the street that he can read all by himself now. We've been fans of Richard Scarry for a long time, having spent hours with my original copy of his "Best Word Book Ever", and we love playing the board game of "Busy Town". This book has something for everyone in our family. 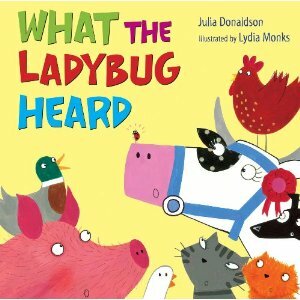 Sophie loves ladybugs, so this is a big favorite for her. Nate loves studying the map that the bad guys use to break into the farm to steal the prize cow. And I am struck by Donaldson's exquisite craft every time I read it. When I'm having writer's block, I sometimes pull this book out for inspiration. 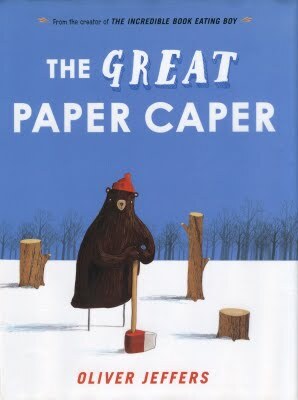 Fun twists, memorable repetition, animal sounds, dramatic tension, a unique hero, and effortless, unforced rhyming (not to mention Monk's great illustrations) make this book work on so many levels.